Manager Russell Slade has hailed Cardiff City's "solid start" to the Championship season. Cardiff moved into the top six after securing a 2-1 win at Nottingham Forest. The Bluebirds are unbeaten after the opening five games of the season and Slade is delighted with his team's start to the season. "We go into the international break unbeaten and we are in a pretty good place," Slade said. "You can't look at anything, as I've said before, until you are 12 games in but we have made a really solid start." 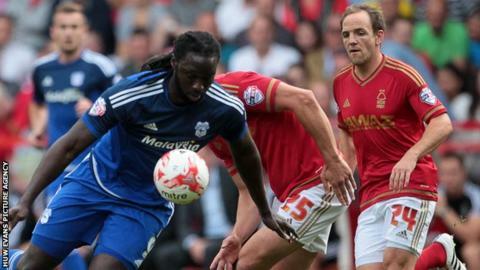 Headed goals from Kenwyne Jones and Joe Mason maintained Cardiff's unbeaten start to the season at the City Ground. Michail Antonio scored from a long ball to set up a frantic finish but Cardiff held on to secure their first away win of the campaign. "It was so important to keep the momentum going," Slade added. "We knew it would be a tough game but I thought we acquitted ourselves really well at times. It was a good away performance. "We dominated possession and looked the better team and caused ourselves some problems towards the end when Forest got a goal back. "We should have put the game to bed." Scotland goalkeeper David Marshall, a target for West Bromwich Albion, played in Saturday's win at Forest. West Brom manager Tony Pulis has not given up on signing Marshall but Slade reiterated his desire to keep the Scotland international. "I can't see anything happening," Slade said. "I've said all along that we don't want to lose our quality players and that's what David is."